“brewed for the harvest” This beer begins in spring when oat seeds are sown as soon as the soil can be worked. Meanwhile, select types of barley are planted with hopes that Mother Nature will be kind. Our brewers wait patiently until the legumes are mature and ready for the scythe. Upon delivery to the brewery, these ingredients are mixed together in the mash tun where they steep, creating a rich molasses-like liquid. Spicy hops are boiled with the thick brew, giving balance and complexity. Brewers yeast feasts upon the rich sugars, concluding its transformation into oatmeal stout. 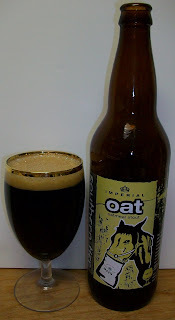 Pour Oat into a snifter, allow its thick tan head to slowly rise, releasing unbridled aromas. The color of Oat is as dark as a moonless night. The first sip reveals Oat’s thick and nourishing taste. Like a haversack to a horse, a bottle of this stout is a meal in itself. The beer pours a dark brown completely opaque. Well, in this particular glass there is just a hint of dark amber hues just at the tip of the bottom of the cervoise glass. In any other glass it would be completely opaque. There was a very small, chocolate milk color head. Wow, what a smooth imperial stout. Yes, you can taste the alcohol but the beer is so rich and smooth is subtle. The taste starts with sweet dark roasted malts up front then the most exquisite creamy mouthfeel though the middle of the sip. In the back-end you pickup up some malt bitterness and this is also where you start to feel the alcohol. The finish is dried mainly by the alcohol but there is also a slight hop bitterness. The final aftertaste is rich dark roasted malts with chocolate and coffee notes. Your entire mouth is left with a rich creamy malt coating. You just can’t help moving you tongue around savoring all of the rich flavors. This in one exquisite beer but it’s not for everyone. This is an imperial stout; high in roasted malt flavors and alcohol. The beer is now at 61. I really expected some change in this beer as it warms a little. Don’t get me wrong, it’s very good, excellent in fact. I just expected the malt flavors to become more pronounced and change somewhat as it warmed up. This beer really tastes the same now as it did when it was cold. Let’s see what happens as it warms even more. Well I must say that this beer finished nicely. The final sips were at 72 degrees and still very nice. There was a slight harshness at the end I seemed that the alcohol was stronger at these temperatures. The one thing I did notice was the lack of oats. Usually an oatmeal stout is very hearty. This was very creamy but without that robust oat heaviness. There was no head or lacing but the beer and alcohol are so heavy it clings to the glass. All and all this is a very good Imperial Stout. I thought is was odd that it did not open up more or change in any way when it warmed up. So this beer is a solid B+ maybe an A-.